Thank you for checking out my second video on mikedolbear.com! In the previous video, I showed you how to put together your first drum beat – the classic 8th note pop/rock beat. Since that drum beat is the foundation of literally hundreds of drum beats, make sure you are comfortable with this before moving on to this lesson. I would say that if you can play that beat comfortably and solidly while counting out loud, then you are ready to progress. Get ready to add some cool bass drum variations that will be challenging, and above all, a lot of fun! As you will see from the sheet music below, your hands stay the same, but your bass drum foot has a lot more to do! Remember, relax, play slow, count out loud (super-important) and have fun. When you are confident with these beats, try playing along to one of your favourite songs to see if any of these beats fit. Be sure to choose something with a manageable tempo – 60bpm-100bpm is preferable. 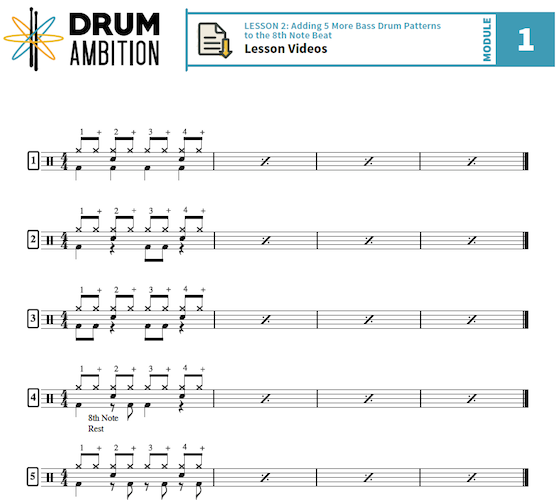 Check out www.drumambition.com for our full curriculum, with downloadable sheet music, HD videos, and full support. There are also a number of blogs with useful information for beginner drummers, including practice tips, motivational messages and practical ideas.